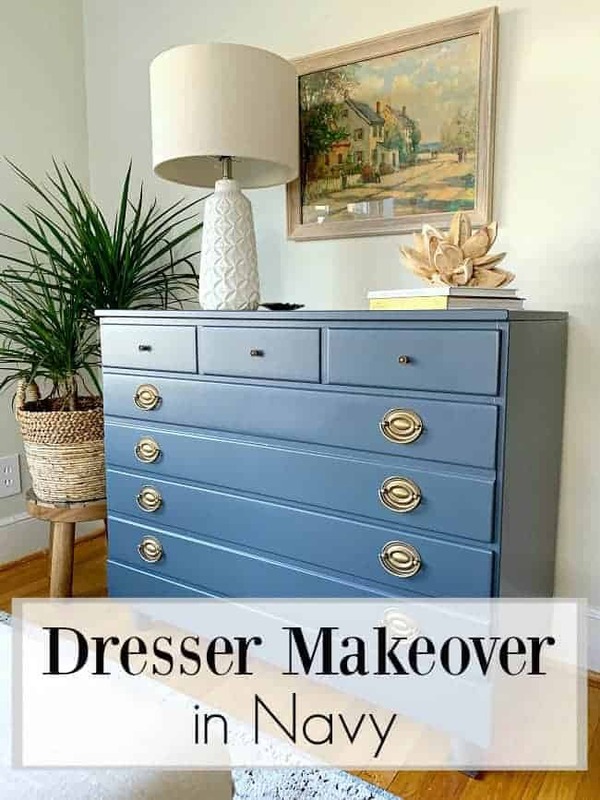 An easy DIY dresser makeover in navy. 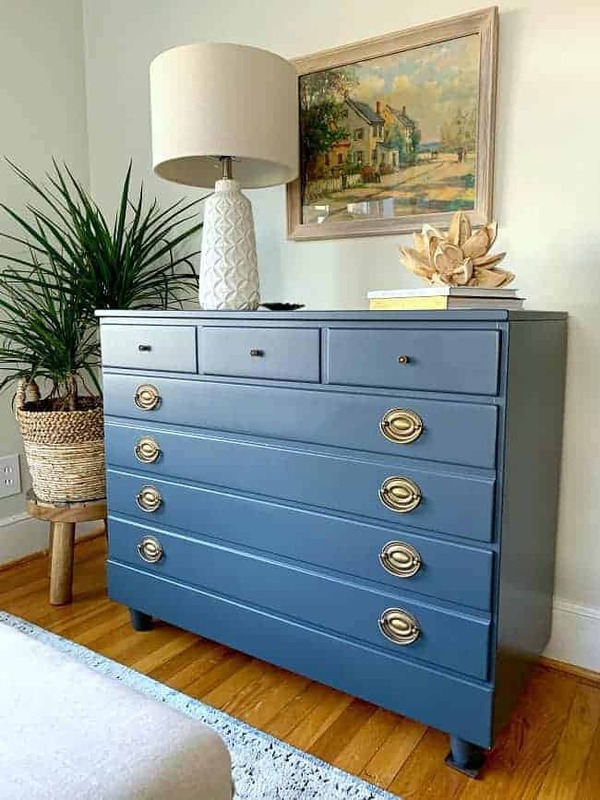 You’ve already seen our guest bedroom makeover update, but today is all about the Goodwill dresser that got a quick makeover with 4 new feet and paint. 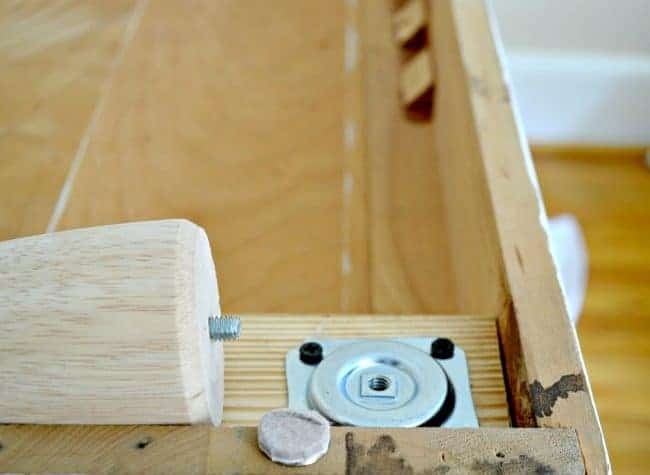 Are you ready for a good ol’ fashion DIY dresser makeover before and after? Make sure you check out the sources for this makeover at the bottom of the post. 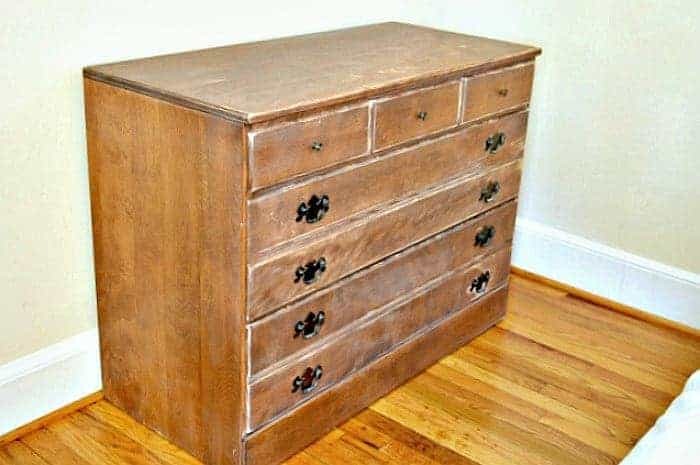 This old dresser started out as an ugly duckling. I found it at Goodwill and as soon as I saw it, I knew that it was coming home with me. The outside was a little rough but it was well-made and very sturdy. I looked inside the top drawer and saw that it was made by Ethan Allen. It was a very lucky find. I made the hubs stand by it while I skipped up to the register to hand them my $5. Yes, I got this baby for only $5 (and yes, I actually skipped up to the register)! I brought it home and it sat in our basement (in our Illinois house) waiting for it’s fab makeover. We ended up moving to North Carolina before I could do anything with it so it came along in the hopes of a proper home, and fresh paint. Once we were all settled, I decided that it was finally time to give it a makeover. Like I said, the outside was in rough shape so I knew it would need a coat of paint. Before I could get to that though, I had to take off the old hardware and give all the wood a good sanding. Besides the battered exterior, the dresser sat pretty low so I decided to give it four chunky feet to give it some height. Next, I gave it a coat of paint. The first time I painted it I used a soft, icy blue color. 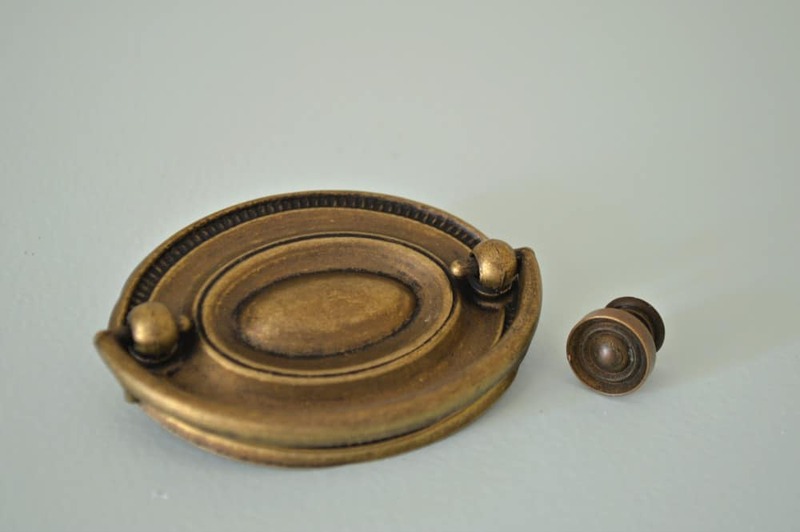 I also found some beautiful antique brass hardware to replace the old hardware. We ended up putting it in the guest bedroom and the hubs used it to store his work clothes. All was well for awhile and then we started the construction on the new powder room. We left the dresser sit in the room so the hubs could have quick access to his clothes. With all the tools in the room it got pretty beat up so I knew that it would eventually need another makeover. I had done all of the hard stuff the first time around so all it needed was a quick sanding and a couple coats of navy paint. I removed the brass hardware, gave the dresser a quick sanding, wiped it down to get the dust off and applied my paint. My weapon of choice when painting furniture is a small paint roller so I got that out and went to town. I’m not sure that it’s the “proper” way to paint furniture but I like how easy it is and I always get a perfect finish with no brush marks. I do use a brush to cut in tight spots but I do that first and then go over it with the roller. Just 2 quick coats, plus drying time, and the dresser had a completely new look. I love how the navy sets off the antique brass of the hardware. Take a peek at the feet that I added. 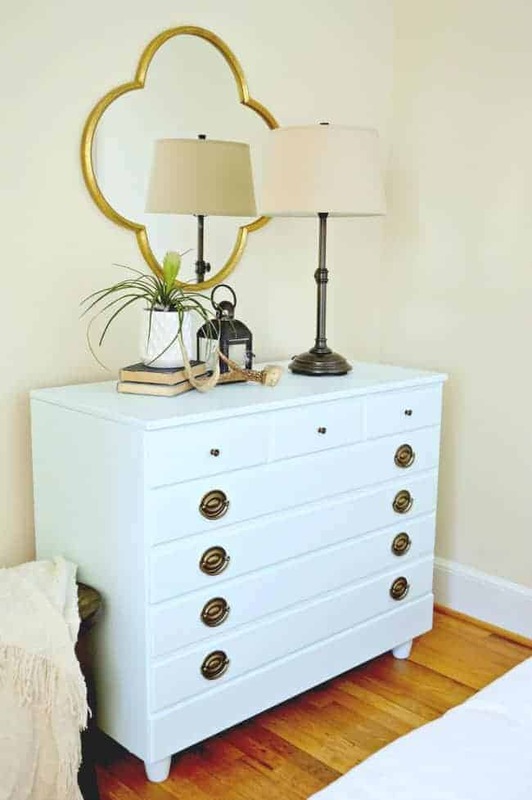 It’s a quick and inexpensive way to change up an old piece of furniture, and add some height. I hung my thrifted painting (that I fixed up) and found a lamp in the perfect height. I love everything about this side of the room. Now I just need to get at that crown molding, and figure out the off-center ceiling light fixture. I’m so close to calling this one done. Want to see more? 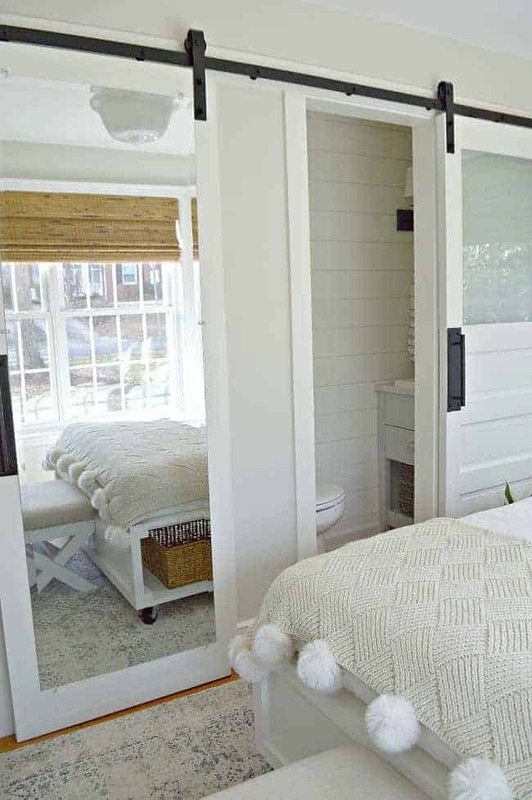 Check out the rest of the guest bedroom, and the new powder room. I love the colour and the new handles. So classy. Thanks so much, Claire, I appreciate it! Where can I find that 3 leg stool? Who sells this Hale Navy paint? Is that the color? I love how this dresser turned out in it’s new navy outfit, Kristi!!! Really beautiful! I appreciate it! Thanks so much, Barbara! It is amazing what paint can do for a neglected piece of furniture. Thanks so much, Julie! I appreciate it! The dresser looks fabulous! I have a dresser in my guest room that could use a makeover. You have inspired me to do it! Can I ask where you got the lamp? I love it! Thanks so much, Terry! I’m glad I have inspired you to give your own dresser a makeover. 🙂 If you read to the end of the post, I list my sources for products there. Love it! This is such a pretty shade of blue. I love all the accessories and the room too. It all turned out so pretty. This is such an inviting and cozy room. Thanks so much, Julie, I appreciate it! We are really loving the way the room is turning out! Beautiful makeover! Your painting skill is stellar! I have an Ethan Allen piece in this same suite. Wow, the Ethan Allen piece looks fabulous! I think one of my girls had a piece like it when they were young. Thanks so much, Donna! 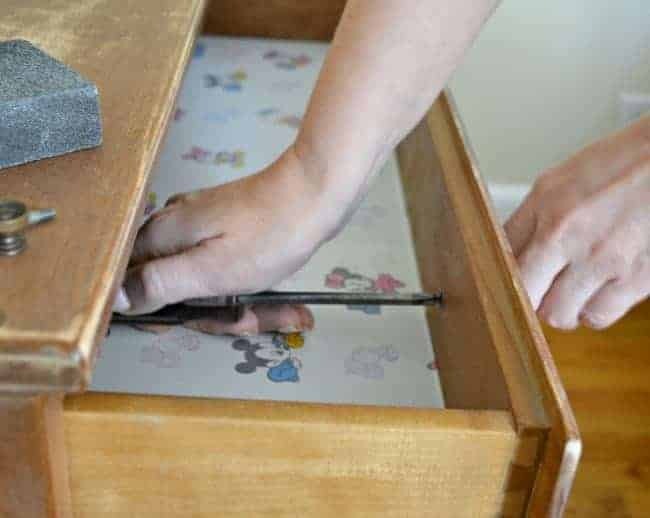 🙂 Judging from the baby drawer liners, and lower height, I believe it was used as a changing table. I was worried that it would look like a child’s piece but I think the added height and new hardware help grow it up (at least I hope it does 😉 ). This is just gorgeous! I love the blue and brass combination o this, fantastic! I also can’t get over what a deal you got on this Ethan Allen piece, you go girl!! Thanks so much my friend! Deal of the century, right? 😉 That never happens to me so I didn’t pass it up. I’m glad we were able to use it in our new space. I wish I had your “eye” and your vision. I would have seen that dresser and thought it was a piece of junk! You inspire me! 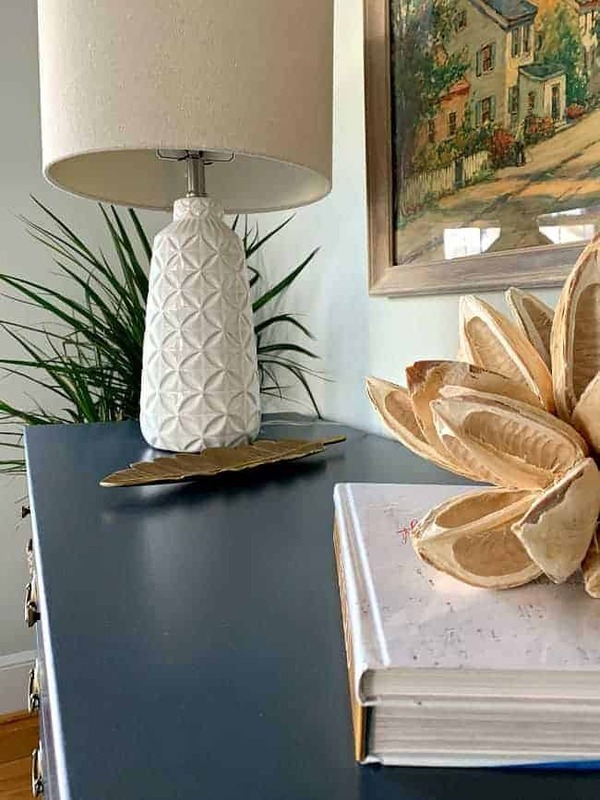 That Hale Navy on the dresser is perfect! I agree that the darker color sets off the hardware. Your talent knows no bounds. The dresser was a steal and you made it so pretty, love that color. Everything about that guest room is just so smart and perfect for a guest. How beautiful! I love Hale Navy and that Advance paint is the best for painting furniture. Great job! Advance is definitely the best! I love using it and the finish is always flawless. Thanks so much, Shelley! Love the darker blue color. The light blue would have been great in a baby’s room, but the navy blue is pure grownup! What you’ve done with this tiny room is outstanding. I have a similar sized room that needs “refreshed” but I don’t need to worry about a guest bathroom – it’s directly across the hall. However, a large window and a closet door need workarounds, so you’ve given me hope it can be done. Be careful – your guests may not want to leave. Thanks so much Pat, I appreciate it! I agree…the navy is much more grownup. I’m so glad I went for it. 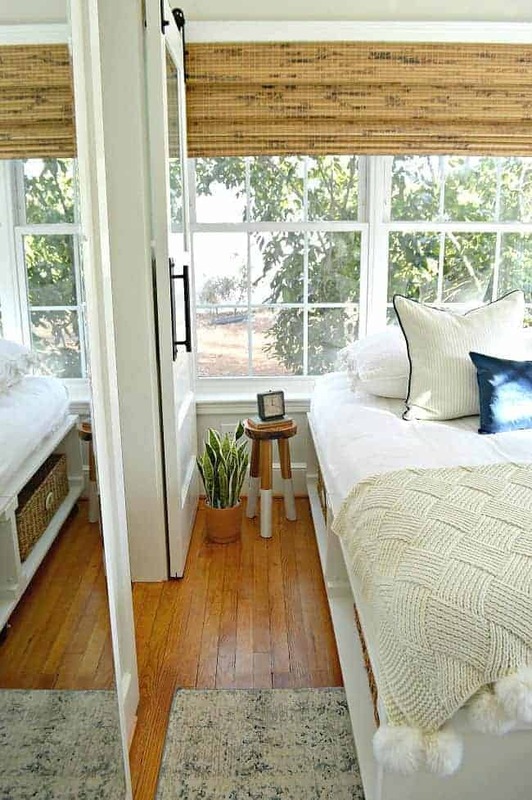 Small rooms are definitely challenging but they can be tamed. I find that I end up ignoring the “rules” and do what I feel looks right. With a smaller room there are no rules. 😉 Don’t give up hope! You’ll figure it out. Kristi, as pretty as the city blue was I just LOVE the darker blue, really makes the brass look GORGEOUS! Great job! I’m looking for something similar for a guest room. Want to get rid of the old Victorian oak sewing stand that my new sewing machine doesn’t fit in because it’s just taking up prime real estate! I’ll keep looking. Your little makeover gives me hope! 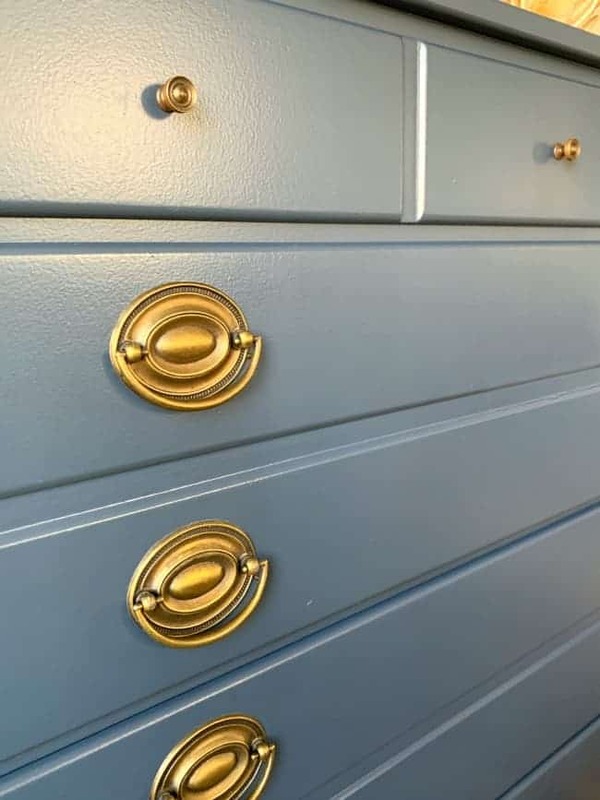 I love it in the darker color..the light blue didn’t show off those beautiful brass hardware. I am a HUGE fan of Goodwull and I go at least once s week to two local stores here. I have found some great treasures there o er the years.a great way to help the environment and save money to. It’s a treasure hunt for me. 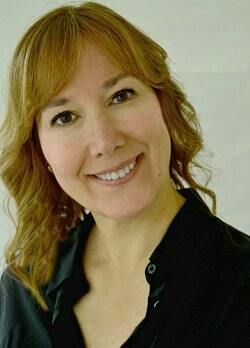 Great job again, Kristi! I much prefer the navy color and it fits the room too. You paint like a pro girl. Looks great! I like the navy color better.. Enjoy your blog. Did you use an electric sander on this? What kind?